I am no great student of Israeli domestic politics and my perceptions/knowledge of the Israeli elections are only what I have gleaned from media reports. However, I do try to also read reports from the Israeli media and not just from the western mainstream media. 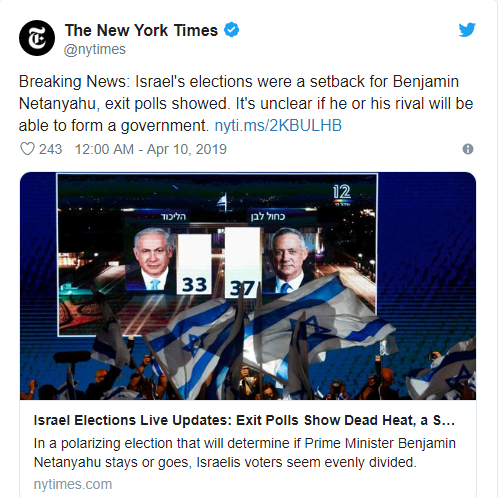 Over the last few weeks the “liberal” mainstream media have been supporting an anti-Netanyahu position and most of their reporting has been critical of Netanyahu and his chances in the 2019 general election. Last night, just before I went to bed, the exit polls were showing a close race between Likud and Blue & White. The “liberal” press had started putting out headlines about a “setback for Netanyahu”. The New York Times – among others – has been hoping for a Netanyahu defeat. This morning, as exit polls are replaced by vote counts, I find that Benjamin Netanyahu’s Likud party narrowly won the Israeli election. With 97% of the votes counted former Israel Defense Forces (IDF) chief of staff Benny Gantz, led the opposition Blue & White party to a strong showing. Both parties will receive 35 seats (out of 120) in the next Knesset. Likud received 26.3% of the vote and only just exceeded Blue and White’s 25.95%. No single party has ever won an overall majority on its own. The right parties are expected to have 65 seats and the left parties 55. It is virtually certain that Netanyahu will form the next coalition government. 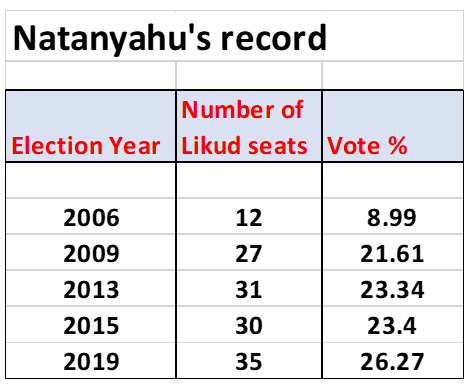 But the reality is that Likud have won more seats this time than they ever have under Netanyahu. Likud has won 5 more seats than in the outgoing Knesset. The only time Likud have done better in an election was in 2003 with Ariel Sharon when they received 29.39% of the votes and 38 seats in the Knesset. The “liberal” media have become peddlers of opinions and cannot be relied upon to be purveyors of facts. The Fake News phenomenon starts with their increasing presentation of opinion and wishful thinking as fact. The nuclear non-proliferation treaty is fundamentally flawed. Establishing a monopoly for some selected countries is unsustainable in the long run. But the opposition of the GOP, Benjamin Netanyahu and now Saudi Arabia to any nuclear deal with Iran makes an unholy alliance against a deal but which is counter-productive. It provides an unusual indication that Barack Obama – by accident rather than by design – is on the right track with his negotiations with Iran. The general expectation of course is that a deal is inevitable. It will be reached (at some time if not now) where Iran will – with certain safeguards – continue the enrichment of uranium for the production of nuclear fuels and the UN sanctions will be lifted. As far as nuclear weapons are concerned, no international treaty can succeed unless all member countries sign up to the same obligations. It cannot be a few reserving special positions for themselves and imposing different obligations on all others. Four of the nine nuclear countries are not signatories to the nuclear non-proliferation treaty. SIPRI: At the start of 2014 nine states—the United States, Russia, the United Kingdom, France, China, India, Pakistan, Israel and North Korea—possessed approximately 4000 operational nuclear weapons. 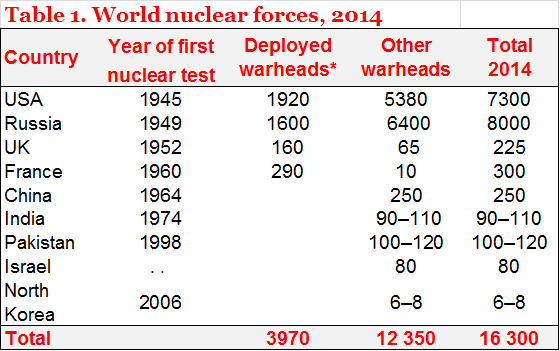 If all nuclear warheads are counted, these states together possessed a total of approximately 16 300 nuclear weapons (see table 1) compared to 17 270 in early 2013. …. all five legally recognized nuclear weapon states—China, France, Russia, the UK and the USA—are either deploying new nuclear weapon delivery systems or have announced programmes to do so. India and Pakistan continue to develop new systems capable of delivering nuclear weapons and are expanding their capacities to produce fissile material for military purposes. There is an emerging consensus in the expert community that North Korea has produced a small number of nuclear weapons, as distinct from rudimentary nuclear explosive devices. * ‘Deployed’ means warheads placed on missiles or located on bases with operational forces. The GOP letter to Iran makes for an interesting precedent. It emphasises – again – that the US is now highly polarised and that the government does not represent a very large section of the country. But the GOP actions (their Iran letter and their invitation to Netanyahu to make a speech) are primarily about opposing Obama and secondly about supporting Netanyahu. The support is for Bibi himself and not for any “socialist Israel” which they – and Netanyahu – fear. (In fact most of the Republican business world would quite welcome the lifting of UN sanctions). Netanyahu’s opposition to any deal with Iran is not unexpected. Israel is the sole nuclear force in the region and this underpins its existence. Even its massive superiority in conventional forces could not prevail against another country in the region prepared to use nuclear weapons. The deterrence strategy – based on overwhelming superiority – which has served Israel very well would fail against a more “equal” opponent who was more ready to use nuclear force than Israel. “A mad mullah would be more ready to destroy himself while destroying the enemy than a mad rabbi”. The Saudi Arabia opposition to anything which benefits Iran is the front-line of the Shia – Sunni war. Moreover Saudi has plans to build 16 nuclear plants over the next 20 years. The idea that Iran could produce nuclear fuel while they had to import all theirs is unthinkable. Anything Iran gets is something that Saudi Arabia also must have. BBC: A senior member of the Saudi royal family has warned that a deal on Iran’s nuclear programme could prompt other regional states to develop atomic fuel. Prince Turki al-Faisal told the BBC that Saudi Arabia would then seek the same right, as would other nations. Six world powers are negotiating an agreement aimed at limiting Iran’s nuclear activity but not ending it. Critics have argued this would trigger a nuclear arms race in the region spurred on by Saudi-Iran rivalry. …… Riyadh has also signed nuclear co-operation agreements with China, France and Argentina, and intends to construct 16 nuclear power reactors over the next 20 years. …..